A lousy snowpack year in the Sierras only means one thing: a longer summer! 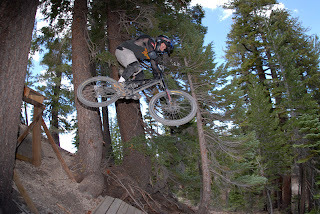 Mammoth Mountain is melting fast, and it wont be long before some of the freeride trails on the mountain are clear. The temperature is supposed to be in the 60's this week, creating great tacky trail conditions. The early season snowmelt, adds the much-needed moisture to the pumice soil. Many of the great cross country trails are starting to get stomped down; Downtown, Uptown, Mammoth Rock Trail, Paper Route, Lakes Trail, and Juniper Trails. Of course, Lower Rock Creek Trail has been going off for awhile. Check out the Mammoth Mountain website for webcams and weather updates. The Bike Park won't actually be open until June 23rd, but most of the trails should be clear much earlier.